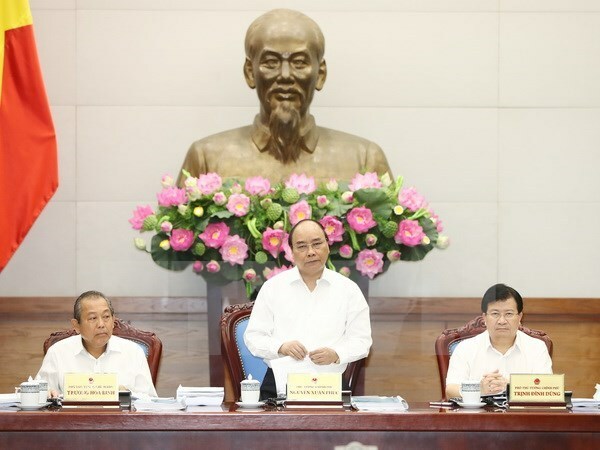 Hanoi (VNA) – The Government convened a meeting on law making on August 22, during which Prime Minister Nguyen Xuan Phuc said many laws still hamper each other. He said regulations are a bottleneck in national development, adding that the Government has submitted several legal documents to the National Assembly and prioritised institutional building in its meetings. However, there remains a huge demand for building, amending and supplementing institutions. While the Government is making efforts in administrative reform, some proposed laws create more procedures, raising the already large number of procedures. Some of their contents fail to match with reality, he added. The PM said it is important to remove bottlenecks so that legal regulations and policies match with reality. He underlined the important task that all barriers and difficulties must be tackled in a timely manner to provide optimal conditions for production. At the meeting, Cabinet members commented on nine draft laws, decrees and reports, including the draft law on competition (revised), the draft law on revisions and supplements to some articles of the law on environmental protection tax, the draft law on special administrative-economic units, and a decree on building a draft securities law (revised). According to the Ministry of Planning and Investment, there are 4,284 business requirements and conditions for 243 sectors and industries under the management of 15 ministries, which are regulated in 237 legal normative documents. Many business conditions overlap while procedures are stipulated in different decrees, circulars and decisions, it noted. The ministry proposed the complete or partial abolition of business conditions relating to finance, location, production capacity, manpower, mode of business and planning. Surveying enterprises in the industry-trade, transport and science-technology sectors, the Vietnam Chamber of Commerce and Industry (VCCI) asked for the repeal of 56 business conditions and amendments to four others in five of the 28 conditional business lines managed by the Ministry of Industry and Trade. The group also called for 27 conditions to be removed and four to be revised in four of the 29 business lines managed by the Ministry of Transport. VCCI also called for 13 conditions to be eliminated and five others revised in five of the eight business lines managed by the Ministry of Science and Technology. PM Phuc ordered the relevant ministries to consider the survey results of VCCI and the Central Institute for Economic Management while overhauling unnecessary business conditions.